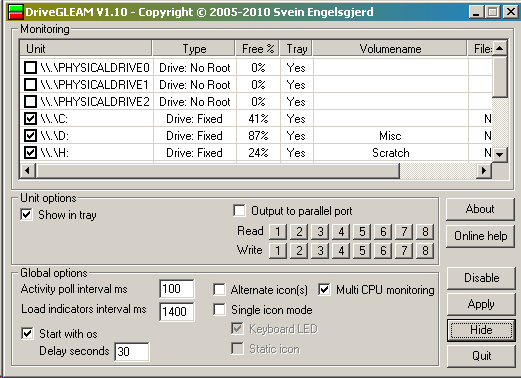 DriveGLEAM is a small program designed to show read/write activity for your hard disks in system tray. DriveGLEAM also supports output via parallel port so that you can for example have a red led for write and a green led for read access. DriveGLEAM can come in handy to system administrators who remotely log into differerent computers as the application allows them to easily watch the system notification area for any activity on the harddrives. DriveGLEAM supports controlling a external LED panel via the PC's parallel port. It uses very few resources and does not unlike other simmilar tools use hooks or other "tricks" to get the job done. Also please note that even if DriveGLEAM is known to be quite robust and if DriveGLEAM would crash, it's designed NOT to cause any drives freezes, data corruption or losing. TE Allows for CPU, RAM , VRAM usage display in tray. TE Keyboard scroll lock LED option. TE Standalone, does not require a install but uses inno setup for your convenience. TE Failure in DriveGLEAM can't "freeze" your drives.